Perhaps able to foresee that even the longest federal election campaign in Canadian history would fail to prioritize the serious consequences of climate change, University of Alberta professor emeritus Gordon Laxer has gone ahead and done the hard work for us. 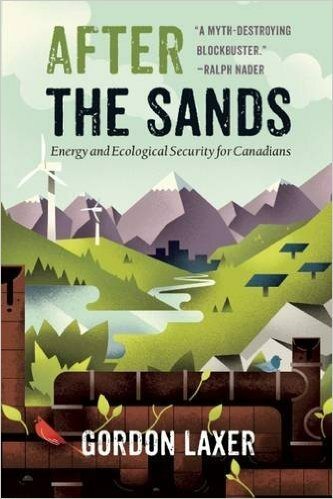 With After the Sands, he’s produced a detailed analysis of the Alberta tar sands – the largest source of Canada’s greenhouse gas emissions. Laxer advocates transforming Canada into a conservation-based society and employs a straightforward toolbox to help shepherd that difficult transition. At a time when everyone from the pope to Barack Obama has identified climate change as humanity’s greatest security threat, successive Canadian governments and most political parties continue to allow oil multinationals to dictate climate policy, determining the country’s narrow range of emissions control programs, pushing environmental deregulation, and bulldozing limits imposed by global agreements such as the Kyoto Protocol. The avoidance of serious discussion was witnessed in the firestorm greeting NDP Leader Thomas Mulcair in 2012, when he presciently warned of the danger posed by reliance on a one-resource economy. This so-called “Dutch disease” is now afflicting Alberta’s oil patch. Mulcair quickly backed away from his comments, while NDP candidate Linda McQuaig briefly reignited the flames last summer when she boldly suggested – then went silent about – keeping tar sands oil in the ground. Enter Laxer, a political economist and former head of the Parkland Institute, which The Globe and Mail once crowned the “unofficial opposition” to Alberta’s long-ruling provincial Conservatives. A self-described “public intellectual,” Laxer raises uncomfortable truths and carefully negotiates his way through the thick fog of propaganda produced by government and big business. Laying out the case that Canada is more energy colony than superpower (Canada imports 40 per cent of its oil), Laxer is one of those rare birds in the world of political discourse who seems genuinely interested in dialogue, so much so that he has eliminated the “tar” and “oil” prefixes to Alberta’s “sands” in order to tone down the temperature of the debate. Instead of wielding rhetorical brickbats, Laxer relies on an extensive array of research and policy papers that force readers to do some serious thinking. He poses questions based on science and situated within the context of serious obstacles currently preventing Canada from turning the climate tide. Among those uphill challenges is our continued fealty to the North American Free Trade Agreement, under which Canada is obliged to export its energy supplies before meeting the needs of Canadians. Canada maintains a perilous position as one of only two International Energy Association nations that does not stockpile an emergency 90-day store of fuel to address supply disruptions or national emergencies. When Laxer took this information to a Parliamentary committee as an invited expert witness, the Conservative chairman interrupted Laxer’s testimony and dismissed it as irrelevant. A majority of MPs voted to continue hearing from Laxer, so the Conservative chair adjourned the meeting. Ploughing through such history may seem pointless in the face of Arctic ice melt and emaciated polar bears, but Laxer notes that Canadians need not reinvent the energy-security wheel in order to navigate the road to a carbon-free future. He points out that successful policies initiated during the 1960s and ’70s – from nationalizing industrial production to imposing higher resource extraction royalties – can be revisited and refined to place them in a contemporary context. While his text can be laborious, it is thankfully broken up by plenty of subheads and helpful illustrations. Laxer’s work deserves a better font; the one used here is less than elegant. Better editing would reduce repetitive phrases and avoid embarrassing gaffes (the Twin Towers did not fall on September 9, 2011). carbon-free Canada: phasing out oil and natural-gas exports; working with indigenous communities; establishing proper environmental safeguards; building an emergency energy stockpile; and relying on conventional oil, natural gas, and hydro, along with incentives provided by democratically determined national energy quotas. These ideas read a lot better than any of the sound bites from this fall’s campaign hustings.